Recently, I took eight titles from my collection that I no longer read and have them exchanged for new titles. The place where this took place is a coffee cafe in town that hosts a book corner. Their offer is 'two for one' that is for patrons to bring and exchange two titles/books for one title/book from their collection. Some might say 'hey, that's not fair, shouldn't it be a one for one' but to me it is quite okay. I do not mind exchanging two titles that I no longer read anyway for a title that I would want to try reading. Yes, I would end up with less books but when reading it concern, quantity is not the game plan here. Moreover they are not selective of the titles and accepted all the titles that I brought whereas I have a choice of my preferred titles from their shelves. 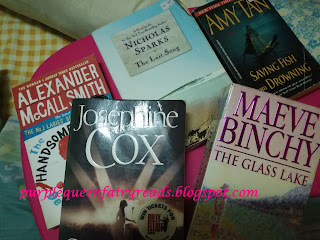 So, from the eight books that I brought, I selected four of the above and the madamoiselle was kind enough to let me take another title when she saw me still browsing through the shelves even after the exchange. And with that I increased my TBR pile by another five titles. With author such as Maeve Binchy, Nicholas Sparks and Amy Tan, among others, I think it's a good deal and am extremely happy. I can't wait to go through them but due to current commitment, these will have to wait till December.